I had to go to the grocery store the other night, and by the time I got home, my hunger was at code red emergency status, and so was Tim's. Immediately, I started in on the dinner concoction of the evening. 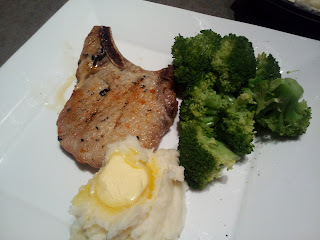 Pork chops were on sale that night, so that was the protein du jour. I seasoned them with spicy curry powder, pepper and salt and threw them on the grill for four minutes per side. While that was working, I steamed a head of broccoli and dressed it with salt and pepper. Finally, I rounded out the meal with some Simply Potatoes that I got through the Foodbuzz Tastemakers program. There are a bunch of different varieties, but I went with the original flavor. I like that they're real potatoes, but I only have to heat them up in the microwave and serve them. And I'm Irish, so I know potatoes (it's true, if you're on Sparkpeople, you know my user name is ILovePotatoes). They're giving away a year of free potatoes, so if you want to keep carb loading for a full year, enter here. And in less than 15 minutes, we were eating a healthy, balanced meal that was delicious.